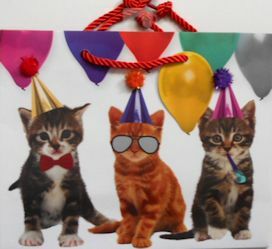 Here are 3 cats ready to party. This image appears on the front and back of this medium cat gift bag. This paper gift bag is 9 3/4" wide x 8" high x 4" deep. Shiny red corded handles. Gift tag attached.